Wood flooring looks nice and is very easy to clean, but in time it can become worn and will need a bit of restoration work to bring the floor back to life. Sometimes, refinishing hardwood floors can be made into more of a process than it needs to be. Thankfully, it doesn’t have to be so complex. You can revive your hardwood floors in just one weekend with a few simple steps if you opt to screen the old finish on your floors instead of refinishing them completely. Typically, in order to bring life back into an older hardwood, it must be sanded down and completely refinished. But sometimes, screening can be a better option. If you have wood floors in your home, they should have a clear coat on the top that protects them from scratches and other hazards. If the damage to your floors is only in this topcoat, there’s no need for completely refinishing your wood floorings. You can make them look brand new with just a coat of polyurethane. To screen your wood floorings, you’ll have to do some prep work beforehand, including deep cleaning the floor, fixing deep cracks, and roughening up the wood by using sanding screens. The process of screening your wood floorings will be a lot less time consuming and messy than completely refinishing them. Not to mention, whenever you sand your wood flooring to bare wood, some of the wood is removed, which becomes a problem if done more than once. Re-coating will work no matter what type of wood floorings you have, but if your wood floors are older, the old finish is probably not going to be compatible with the new one. In cases like these, you’ll need to sand down your floors and completely refinish. If your hardwood floor’s refinishing product came before polyurethane was used, the only alternative product to use is wax. You can wax your floors to temporarily take care of the problem, but since wax isn’t incredibly durable, you’ll end up having to continuously re-wax your floors. It’s a good idea to test out your new finish before you coat your wood floorings with it. Debris and household chemicals can also have an impact on whether or not refinishing will work for your floors. With these things in mind, once you determine that screening your hardwood floors is the best option for you, here are the steps you will need to follow. You’ll want to test to ensure your floors will take the new finish before you start refinishing everything. To do this, you should test out at least two different areas of flooring. At least one test spot should be in a higher traffic area of your home. Clean each of the test areas and sand them with a sanding screen. Once the sanding residue has been removed, you can apply a coat of polyurethane. Wait at least one day and then check the test areas. Your wood floorings should be smooth and you should be able to scrape the finish with a coin without it coming off. If you’re unable to scrape the coating off by applying a bit of pressure to the coin, the floors have passed the test. If the polyurethane begins to flake or comes off by scraping it with the coin, residue on the floors is likely not allowing the polyurethane coat to adhere to the floor properly. In other words, you need to completely sand down your wood floorings and then apply polyurethane. Steel wool. This will be used to remove any marks that are currently on the floor. Bristle brush. The brush should be two to three inches in diameter. Applicator pad to apply the finish. Be sure to check the label to ensure the pad is safe to use for oil based or water based products based on what you will be using. A respirator. While these can be a larger expense, they are necessary for removing any harmful vapors from the polyurethane. Mineral spirits. About one gallon will be sufficient. This will be useful in cleaning your floors thoroughly. Sanding screen. You should get one that is 100 grits or more. A buffer, buffing pad, and sanding screen discs. 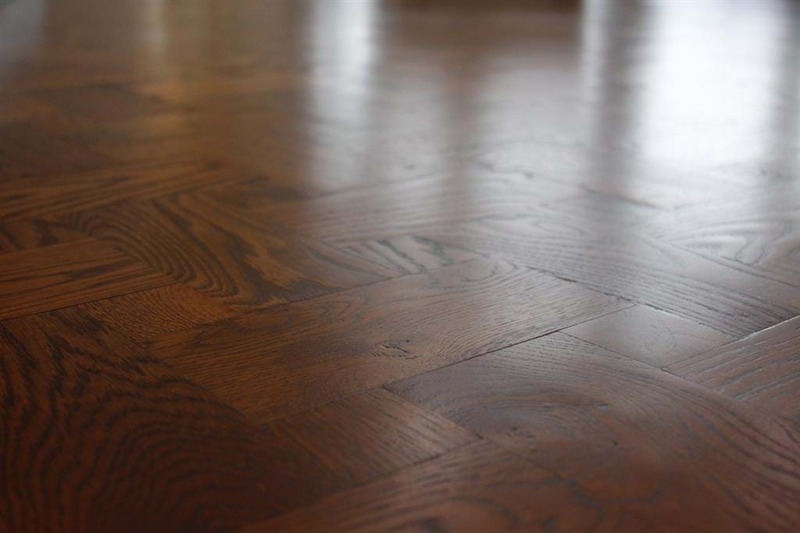 Before you begin buffing and refinishing, you’ll need to ensure your hardwood floors are as clean as possible. For stains that are harder to get out, you will want to break out the mineral spirits and scouring pad. You’ll probably want to mark deep scratches and other strange marks as you deep clean the floors. These are areas you’ll have to pay more attention to as you begin screening and refinishing. For the areas that get the most foot traffic in your home or those that are visibly discolored, you will want to use mineral spirits to wet the area and test out what it could look like with a coat of polyurethane. If everything looks alright, clean the area and apply a coat of polyurethane. Allow the coating to set for a couple days and then go through the process of refinishing the rest of your floors, including the revamped spots again. While you are deep cleaning your floor, you should also look for any ridges or spots on your floor that are not even with the rest. When you sand, Do your best to fix any uneven floorboards. If you can’t fix them, you’ll want to mark them off so that you know not to use a buffer on it. Instead, you’ll have to use a sanding screen and rough up the floor by hand to prevent further damage. Once your floor is clean and you’ve marked off any problem areas to avoid, you can start buffing the wood to prepare it for refinishing. You’ll want to start buffing at one wall and slowly swing the buffer from left to right across the room. Be sure to move through the room backwards instead of forward. You should only buff each area of the floor a couple times. Doing more than this could ruin the floor’s existing finish and hinder your restoration efforts. While buffing, you’ll want to try to control the amount of dust produced by opening windows and using fans to air the space out. You’ll also need to ensure you wear a mask and close off the room you’re working in so your entire house isn’t covered in dust once you’re finished. After you’ve finished buffing, regardless of how cautious you were to prevent dust, you’ll still have some to clean up. Make sure you vacuum, dust, and deep clean the floors and the entire room again after you’ve finished buffing. You can also mop the floor clean with your mineral spirits. If you choose to use any rags, they should be clean and free of any fabric softener or lint. You’ll definitely want to use polyurethane if you’re refinishing floors on your own. Many other types of floor finishing products are very hard to work with or much less durable. But, polyurethanes come in both water-based and oil-based forms, so you’ll need to choose between the two. Oil-based polyurethane is very easy to apply since it does not dry very fast. This type of polyurethane does darken as time passes, so you’ll want to keep that in mind when thinking about the color you’re going for. Unfortunately, with the easy to apply product comes a very strong odor that will require you to apply it in a properly ventilated area. A water-based polyurethane can hold up a bit better than an oil-based one. When applied, the color of a water-based polyurethane is a light white or milky color, but it dries clear. The only drawback is that this finish dries super fast, so you have to ensure everything is applied correctly right from the start since there won’t be time to go back and touch things up before it dries. Once you’ve chosen your polyurethane, you’ll need to ensure you’re using the correct brush with it. Water-based polyurethane should be applied with a synthetic brush. Oil-based polyurethane should be applied with a natural brush for the best results. You’ll only need to use this brush when applying polyurethane close to the wall. For all other areas, you’ll want an applicator pad that is attached to a long, mop-like handle. The most effective way to apply the product is by dipping the pad in the polyurethane and then pressing the pad against the floor to remove some of the finish. Then, using a moping motion, spread around the polyurethane on the floor. Be sure to use even, light strokes and take the applicator from one end of the floor to the other for best results. We mentioned most of the big, important refinishing tools earlier, but you’ll also need to ensure you have the following handy if you don’t already. Refinishing your hardwood floors is certainly a big job, but once you’ve completed it, you’ll definitely be glad you did. If your floors are looking a little scratched, dull, or lifeless, be sure to look into whether or not re-coating them will work for you. Remember, re-coating is not for everyone, and you want to ensure your floors will accept a new polyurethane coat so that all of your efforts are not in vain. Test out the steps above on a small section of your floor to determine whether or not it’s worth doing the entire thing. Nothing is worse than going through all of these steps for all of your wood floorings only to determine that the whole process failed a few days later. If you determine re-coating will work, following these steps will ensure the best results. Don’t try to cut corners or skip steps to save time. Taking on a big project like this means that you’ll have to be very cautious and careful throughout the entire process. You could end up botching your floors and wasting a lot of time and money if you rush through things too quickly. If you determine that re-coating is not for you, it’s best to consult with a professional so that they can help you restore your floors using a more complex process. This type of restoration is not something you should attempt on your own. At any time during your floor restoration process, you should have a professional contact handy to help answer any questions you may have or fix any issues you come across. If you begin the process and don’t feel confident in your ability to effectively complete it, you can always call on a professional to help you out. If you use a flooring company, you can pretty much rest assured that your floors will be refinished or restored properly. Professional flooring companies specialize in refinishing wood floors. They typically have countless hours of experience refinishing floors. Professionals will have all the specialized tools necessary to make the refinishing process go much quicker. This means that they’ll likely be able to get your floors completely refinished and restored quicker and with zero issues than you probably would be able to on your own.